Following Bassaleg’s Assistant Headteacher, Marc Batten’s first visit to Nabugabo Community Learning Centre, NCLC, in 2012, Bassaleg School pupils have taken the school to their hearts. Fundraising has raised over £8000 to date and they have helped to fund the building of a three pot stove in the new brick kitchen building, kitting out the food storage room with lockable cupboards, converting a store room to a library for all year groups and funding porridge for a year to enable the pupils to have breakfast when they arrive in school, ensuring that they enjoy two meals a day. By far the biggest project taken on by Bassaleg was the creation of a story book ‘Tales of Nabugabo’. “We wanted to create a learning resource for the children in NCLC to support them in developing their reading and their English language. 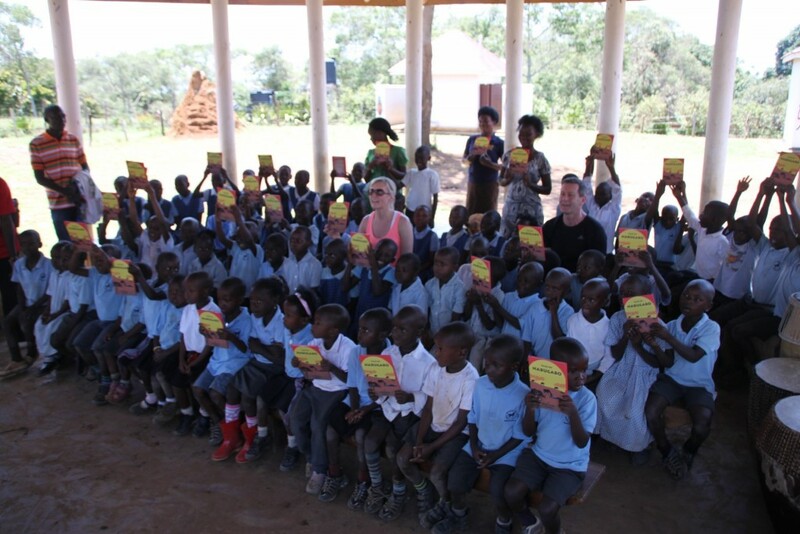 Some of the books donated to the school held very little relevance to the lives of Ugandan children, Spot the dog goes to the fire station – Ugandan children do not know what a fire station is. ‘Tales of Nabugabo’ focuses on the African ‘Tinga Tinga’ style animals painted on the walls of NCLC, who come alive when the children go home from school. Each story tells of an adventure the animals get up to in the school and the surrounding area of Balla village and Lake Nabugabo. Year 8 pupils took on this challenging literacy project and immersed themselves in a day of creative writing, illustration and drama workshops before writing their stories. A team of Year 11 & 12 pupils then worked tirelessly to turn the stories into a children’s story book. The end product was truly outstanding. A visit to NCLC Easter 2015 saw a set of the story book ‘Tales of Nabugabo’ presented to the children of the school. Both the teachers and the children were overwhelmed that a book had been written about their school and couldn’t wait to open the cover and begin reading. By the same evening members of Nabugabo local community had heard about the book and were also eager to hear all about it. These books now have pride of place in their library & classrooms. Pupils of Bassaleg School were invited to present the story book and Bassaleg’s involvement in supporting NCLC to the Lord Mayor of Newport and the City Council. It is wonderful to think of the book being celebrated across two very different communities in different parts of the world. One of the stories in the book tells of ‘Mumbo the Buffalo’, an animal on the wall of NCLC, painting hisown animal in order to have a new friend. He paints ‘Stanley the Bassaleg Stag’ (from our school logo). During the visit at Easter 2015, Stanley was painted on one of the walls at NCLC creating a lasting visual link between the two schools. Bassaleg Art department has created a beautiful ‘Tinga Tinga’ style mural in our assembly hall which was inspired by the animal paintings at NCLC. Visitors to our school always stop and comment on this stunning piece of work which enables us to talk about our work with NCLC and spread the word to all who visit us.